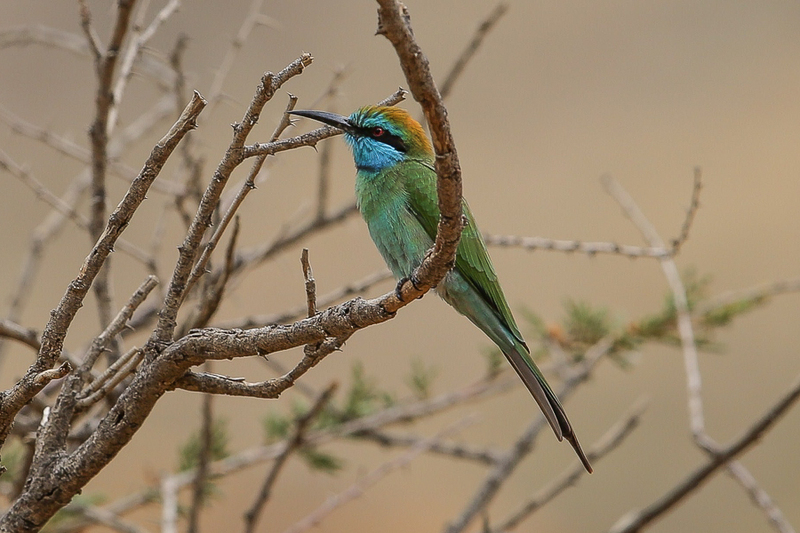 The Arabian Green Bee-eater is usually treated as conspecific with M. viridissimus and M. orientalis, but differs from both in its very short stub-ended central tail feathers; bright blue forehead, supercilium and throat, and bluer lower belly; broader, smudgier black breast-bar; marginally larger size and clearly longer tail (minus the tail extensions) than the other taxa. The new species has two proposed subspecies M. c. cyanophrys occurring from southern Israel to western Jordan and west and south Arabian coasts of Saudi Arabia and M. c. muscatensis occurring from central Arabian plateau and east Arabia (E Yemen to Oman and United Arab Emirates). The race najdanus (from Central Arabian plateau) now included within muscatensis. This proposed new species is not difficult to see and can be seen away from the main endemic rich area of the southwest mountains, although it does not reach as far as the Eastern Province stopping around the Riyadh area in central Saudi Arabia.